In the wake of California’s passage of Proposition 8, protests are popping up around the country -- and so are comparisons between gays’ and African-Americans’ fights for equality. 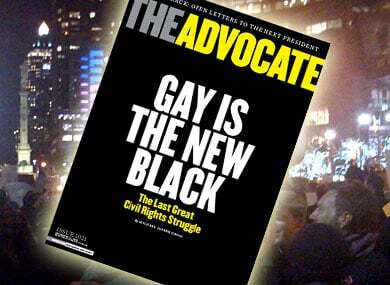 Is gay the new black? Michael Joseph Gross examines two struggles for civil rights. Plus: Photos from Wednesday night's rally in New York City. The night before Election Day, a black woman walked into the San Francisco headquarters of the No on Proposition 8 campaign. Someone had ripped down the No on 8 sign she’d posted in her yard and she wanted a replacement. She was old, limping, and carrying a cane. Walking up and down the stairs to this office was hard for her. The next day, Barack Obama was elected president, and gay marriage rights in California were taken away. At the same time, Arizona voters amended their state constitution to preemptively outlaw gay marriage. Florida went further, outlawing any legal union that’s treated as marriage, such as domestic partnerships or civil unions. Arkansas passed a vicious law denying us adoption rights. The combination of Obama’s win and gay people’s losses inflicted mass whiplash. We were elated, then furious. I’d spent the week in the No on Prop. 8 office in the Castro, a neighborhood where our defeat was existential. For the next few days, wherever I went -- barbershop, grocery store, gym, bars -- I heard people talk of almost nothing else. Incredibly, strangers on the street walked up to me and started conversations about Prop. 8. Taking the long view, some found hope and consolation: 52.3% of Californians voted against us, but 47.7% voted with us, which was the closest we’ve ever come to winning a ballot measure for marriage equality in the state. Other election results were even more encouraging: In New York State, where a marriage bill is pending, we won enough legislative seats to secure a pro-equality majority; Connecticut voters rejected a constitutional convention that could have reversed that state’s legalization of marriage. Still, the election was a blindsiding reminder that the majority of voters, even in a state as liberal as California, still see gay people as second-class citizens. These past few years we’ve made so much progress that we’d begun to think everybody saw us as we see ourselves. Suddenly we were faced with the reality that a majority of voters don’t like us, don’t think we're normal, don’t believe our lives and loves count as much or are worth as much as theirs. History compounds the insult and suggests hypothetical scenarios rendering the mixed result of this election even more absurd. If the California supreme court and the U.S. Supreme Court decisions overturning antimiscegenation laws -- Perez v. Sharp and Loving v. Virginia -- had been blocked by popular vote, Barack Obama might never have been born. His parents would not have been able to marry in several states (although Hawaii, where they were married, had never enacted a law against interracial marriage).